Don’t underestimate the power of ice cream! Hundreds of flavors happen all over the world, and they are loved by any and everyone. Just thinking of all of those creamy flavors is enough to make anyone fall in love all over again. The greatest thing about ice cream is how well it agrees with other pastries, no matter how unusual they may seem. Ice cream is a flexible and amazing addition to dessert, or a tasty snack. Just grab a spoon, and you’re a bite away from heaven! Mochi is ice cream wrapped in flavored rice dough. This hand-held confexion originated in Japan, and has been shipped all over the world, to the delight of ice cream lovers everywhere. Mochi is hundreds of years old, and is enjoyed in many different ways, with the ice cream-filled treat only one of the many ways. Mochi can be cooked with noodles, or the rice dough can be sweetened on its own, and eaten for pleasure, or ceremonial reasons. 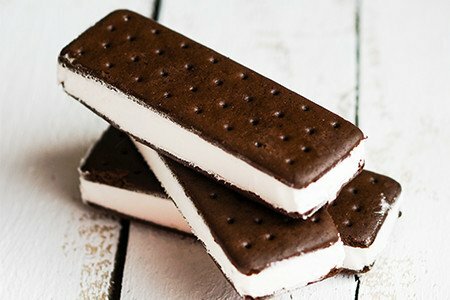 No one can call himself an American if he dislikes ice cream sandwiches. All-American chewy chocolate chip cookies hugging a scoop of vanilla ice cream with sprinkles is more than just a beloved dessert, it’s a phenomenon. You might need a spoon to finish it, but it gets even better: ice cream sandwiches don’t stop at chocolate chip cookies and vanilla ice cream. Diddy Riese in Los Angeles, California is world-famous for their ice cream sandwiches. Diddy Riese is a place where you can have an ice cream sandwich with mint chip ice cream, one sugar cookie, and one white chocolate chip cookie. Don’t miss out just because you don’t know if cookies and ice cream are worth it. One layer of cake. One layer of ice cream. One layer of cake. A mound of buttercream. All together. In one place. You may not be ready for this, but get ready, lovers of cake and ice cream: ice cream cakes have been around for awhile now. With plenty of cake for the cake lovers and plenty of ice cream for the ice cream lover, ice cream cakes make the best dessert for kids’ birthday parties, or for grown-ups on a quiet Saturday night. Unfortunately, it’s hard to find ice cream cakes that are sold by the slice, but that’s just more cake for you! Head into any American grocery store, and you see the perfect solution for enjoying ice cream without worrying about a melty mess: ice cream bars! Extra-solid frozen ice cream is dipped in either white, milk, or dark chocolate, and rolled in nuts or candy before it hardens. It goes back into the freezer, and ends up in your hands! As couture ice cream shops grow in popularity, the one constant on which we can all rely is that ice cream bars will continue to be there to save us from a sticky (but delicious) mess of ice cream.